Available LTL, HotShot, Expedited, FTL, and Flatbed truck loads. Search by State or by Origin-To-Destination points. NEVER HAVE A DEADHEAD MILE! Find Available Truck Drivers and Owner Operators! Truck Drivers and Owner Operators Post Your Truck and Resume. NEVER HAVE A DEADHEAD MILE! Freight Shippers Post Your Available LTL, HotShot, Expedited, FTL, and Flatbed truck loads. UNLIMITED POST of your truck loads. Real Time edit of your live truck load. "What I like most about your web site is that you show the available back haul loads. It's easy for me to plan my trip knowing there are is always a company I can call to pre book a load." "I really appreciate your customer service, by far it's the best service not only compared with other online load boards but major trucking companies as well. " "I was playing on the internet the other night at a truck stop and your web site came up. I found a load I was interested in and gave yall a call. I was surprised someone answered. I got a phone number and called them the next morning and got a load. Thanks." How Does This Website Help Me If I am a Truck Driver or Owner Operator? If you are Truck Driver or Owner Operator you are going to use this site to find available truck loads in your local area or to move truck loads from state to state. Click here to find Available Truck Loads in your state, or to search for truck loads going to different states. Once You have found a truck load that matches your truck type and is availalbe on a day when you can pick up the truck load, Simply contact the shipper of that load with the contact information the shipper left when the shipper placed the truck load. We ARE NOT the Shipping Company, we are a middle-man company between you the truck drivers and the shippers placing the available truck loads. Click Here If You Are Looking for Local Trucking Companies. We Have over 30,000 Trucking Comapies Nationwide in our database. Only Registered Members can view contact information for an available truck load. If your a Trucking Company such as a Freight Forwarder, Shipper, Fright Broker or Freight Carrier you will use this web site to Post Your Available Truck Loads, Find Available Truck Drivers and Owner Operators to move your loads, and to Find Loads for your drivers so they don't have dead head miles on thier return trips. Register Today to post your available shipments. Right Now Loads.com (RNL) has the most features to offer on one website for 1 low monthly fee. "Right Now" means connecting you instantly with thousands of trucking companies, freight loads, truck drivers and Owner Operators nationwide. Freight Brokers, Freight Forwarders, Carriers, Shippers and anyone trying to get into the transportation industry for the first time can benefit from this powerful and easy to use website. Our special features are unmatched on the internet and are the backend that drives RNL to the top of the internet freight matching industry. Most importantly our online load matching system is extremely easy to use. Our website is designed for owner operators to find work fast and get on the road. Our user friendly web interface makes it fast to find exactly what you are looking for weather your a freight broker, owner operator, truck driver, shipper, freight forwarder or carrier. Some of our special features include cell phone text messaging of an available truck load or requesting a truck lane to be filled. All searches can be printed in a print friendly format, and all searches can be downloaded into an excel format. All listings are integrated into mapquest for easy pin-point directions and mileage calculations. This is extremely important for owner operators budgeting their trip. We supply owner operators with WiFi Hot Spots and Gas Stations and Truck Stops that are equipped with internet access so you can find loads anywhere and avoid having deadhead miles. 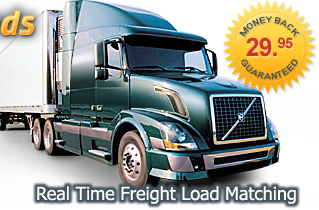 We acquire loads from freight brokers, freight forwarders and our affiliates with major trucking companies nationwide. We are an internet source of transportation information and our main goal is to make a user friendly, knowledgeable, and safe network of members sharing trucking information, loads, freight questions and answers and expand your business off one another. Best of all, this information is available to users 24/7/365 for the lowest monthly fee on the internet! You can’t go wrong. Join us toady and experience the power of Right Now Loads.com More info. Unlimited use-No Hidden Costs. Ask Around We are the cheapest in Town! The first step for owner operators and truck drivers to find high paying available truck loads is to choose their state of interest. Once a truck driver or owner operator selects a state you will be able to find all available FTL, LTL, Flatbed, reefer and Van truck loads that are available for pick up or delivery in that state. You do not have to be a registered member to view available freight loads, however you do have to register to view contact information and post your available truck loads for pick up or delivery. Who Is this Freight Matching Website for? This website is designed for Owner Operators, Trucking Companies, Freight Brokers, Individuals, Shippers and Truck Drivers Nationwide. If you are a truck driver or owner operators you will be able to Find Available Truck Loads nationwide that are LTL FTL Flatbed Van Expedited or Reefer loads. Truck Drivers and Owner operators can also post their availability to delivery freight nationwide by Posting Their Dead Head Truck Availability into Find Freight Loads site and having freight brokers and Carriers contact you OR Owner Operators and Truck Drivers can contact Freight Brokers and Freight Shippers/Carriers that have Posted Shipments on the web site. Freight Shippers can be reached by phone, email, and fax where provided. We know you are not on the internet the majority of the time looking for loads. How else could you make money if you are not on the road delivering loads. Call our Toll Free number 24/7 and we will gladly dispatch available truck loads and drivers contact information so you can keep your truck moving. This service is available to our members FREE we do not accept any commissions for booking available loads for you! If you are a Freight Shipper, Broker or Carrier that has open truck lanes that need to be filled with owner operators that are available in that area to pick up a load. Post the availability of your open truck lane and you will be contacted by owner operators, truck drivers and freight carriers that will deliver your truck load. I Know Auto.com - Automotive directory. Used Trailers - Find Thousands of used trailers for sale from leading dealers and owner operators across North America. The Tractor Trailer Book - his is a book for truck drivers filled with tips on handling a tractor trailer on the highway, on city streets, and at customer locations.